I’m not too motivated to cook dinner these days. Luckily my husband cooks a lot, so he makes sure all the food we have in our refrigerator doesn’t go to waste! Don’t get me wrong, I still cook, I just find it less appealing than before I was pregnant. On a particularly motivationally-low day for both of us, I decided to try tinfoil pack chicken. I have never wrapped chicken up in tinfoil before and cooked it in the oven, so I thought I would give it a try. I made a seasoning blend, cut and rinsed asparagus, and awaited for Marc to get home so he could pound out the chicken breasts. I only had enough tinfoil for 3 pouches and a bit more chicken than that, but we made it work. 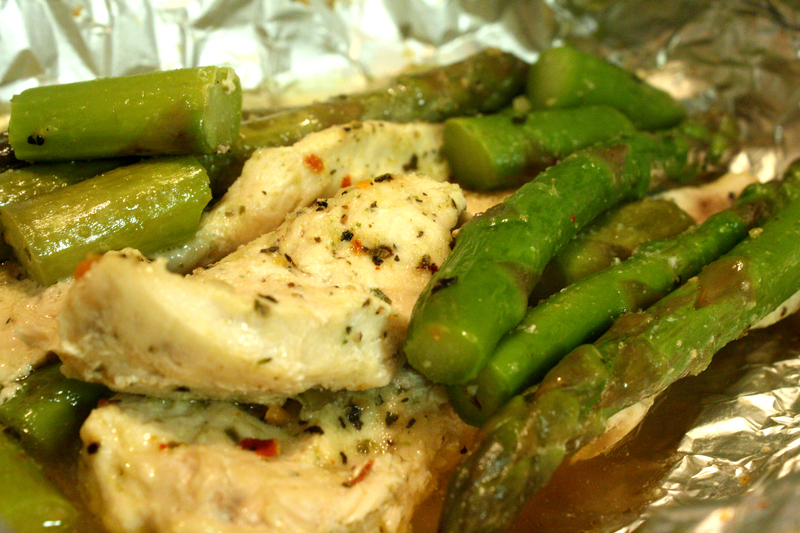 I think if we would have only put one piece of chicken in the packets the asparagus would have turned out fine. The spears of asparagus were less over-cooked than the bottom chunks of aspargus I threw in there. Cubed potatoes or squashes might be good under the chicken in the foil.